As reported in my previous post, Lori and I spent Memorial Day weekend up in Mendocino with our boys and their families. I won’t say too much about the weekend, except that we ate and drank quite well. It took a lot of running after the grandchildren to avoid a huge weight gain for the weekend. One highlight which deserves mention was our “Dude” night: we watched The Big Lebowski and drank White Russians. After the little ones had been put to bed, of course. On the way home we went through Anderson Valley. It had been a number of years since our last visit to any of the wineries there. Since we were traveling as a group, we decided that one winery and lunch would be our stops. The winery we chose was Roederer Estate, the sparkling wine people. Lori and I aren’t huge sparkling fans, but we do enjoy a glass now and then. Our younger son, Jacob, and his wife Brittany are huge bubbly fans, and this was a highlight of the trip for them. Roederer is a beautiful facility, wonderful to visit and taste at. They also have a nice lawn outside, and garden, great for the grandchildren to run around on and play hide and seek. They had a nice selection of their sparkling wines open. The one that they’ve gotten the most acclaim for is the Brut Rosé. We walked out of there with both non-vintage and vintage versions of this, including a magnum of each. After that we headed into Boonville for lunch, at The Buckhorn Boonville (“A Fine Grub Pub”). 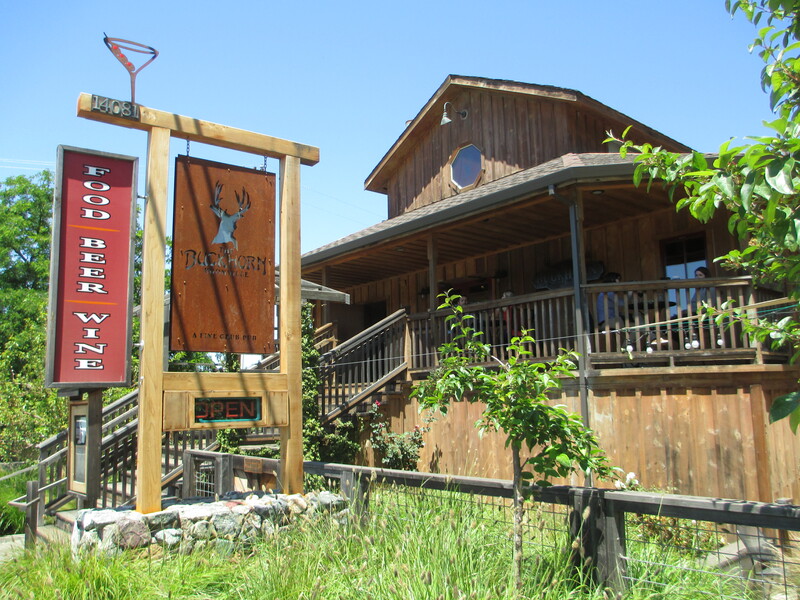 While Anderson Valley is known for its wineries, it’s also home to Anderson Valley Brewing Company (AVBC), one of the best microbreweries around. Their Boont Amber is widely distributed, but my favorite is the Hop Ottin’ IPA. There’s no AVBC brewpub, but the Buckhorn has carried nearly the full line of AVBC beer for as long as we’ve been heading up there. So we ordered a pitcher of the Poleeko Pale Ale for the table, ordered some fine grub (the food was very good, as always), and watched the S.F. Giants win another baseball game. Nice way to end a holiday weekend. This entry was posted in wine tasting and tagged Anderson Valley, Anderson Valley Brewing Company, brut rose, Buckhorn Boonville, Mendocino, Roederer Estate, sparkling wine on July 4, 2015 by vvblogman.